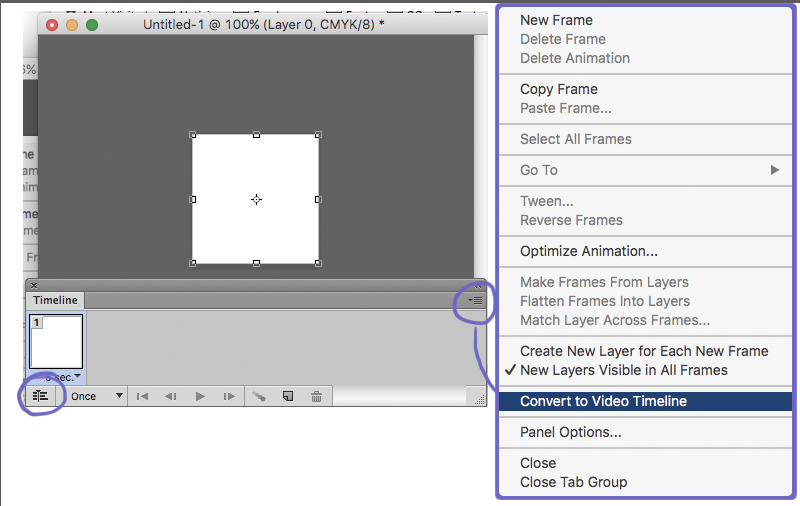 how to change “frame animation” to “video timeline”? When i open the timeline window it directly opens up as frame animation and it doesn't show me the option where you can choose either "frame animation" or "video timeline" so where do i change it? I made a screenshot showing the two way to switch from Frames to Timeline mode. But this is not your case. More: I made a CMYK file just to see if the icons would disappear. More info: See this post where it said something about the Extended version: Why does my Photoshop CS6 timeline have a different layout? Considering that you want to create an animation in a CMYK document; what is not so logical, Photoshop should allow the change of animation type if it allows to create a starting frame. It's not a normal behavior. Reset Photoshop to its default settings: restart pressing Alt + Ctrl + Shift Windows or Cmd + Alt + Shift Mac. Video is always in an RGB color mode. Always. You can not create a video with a CMYK document. You must first change your Image Mode to RGB (Image > Mode > RGB). Then you should be presented with a timeline rather than frames. You are presented with a frame animation because Photoshop can convert a CMYK image to an RGB image upon output. But Photoshop simply can not process CMYK as video. It's a similar limitation as the one regarding filters -- only some filters work in a CMYk file, but all work in an RGB file. Not the answer you're looking for? Browse other questions tagged adobe-photoshop animation gif video or ask your own question. 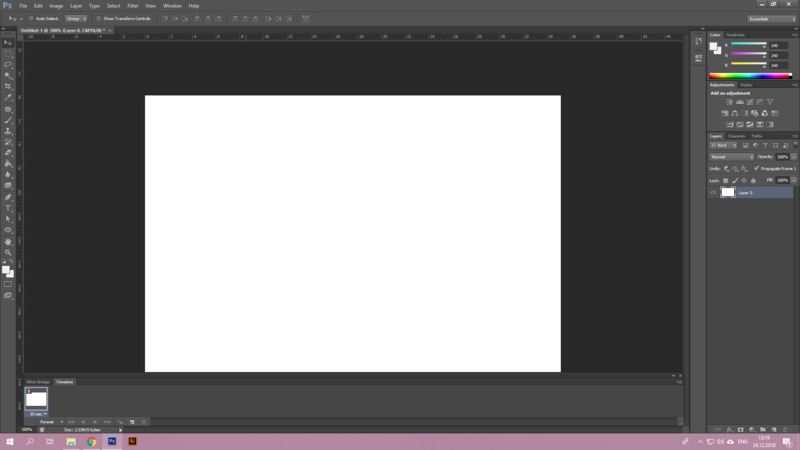 Why does my Photoshop CS6 timeline have a different layout? With photoshop timeline animation, how to I animate a large number of layers moving together (linked)? Render to Video FPS for Frame Animation? How do I create an animated gif in photoshop using the timeline animation?